For this weeks assignment I decided to work on top of the previous data collection and visualization app that I had adapted for correlating my feelings and emotions with the quality of the meals that I was eating and specifically in the aspect of eating alone vs eating with someone. 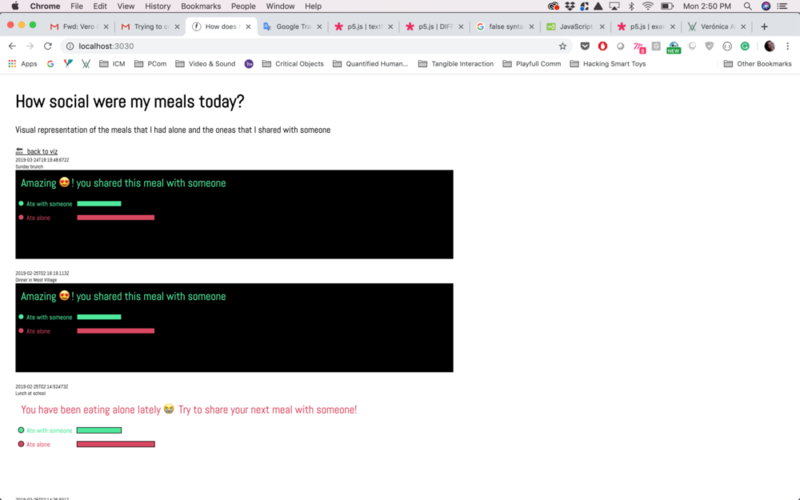 I wanted to create a way to quantify how many meals in total I have eaten alone and make a visual comparison vs the ones that I shared with someone and provide a message to encourage myself to try to share my meals more often since that is a good way to socialize and share conversation with friends during the day. I started by creating a separate page for the “Intervention” that can be accesses from the home page where the individual visualizations for moods are stored. When the user clicks on “Intervention” the app will take him to a separate layout that will contain feedback on specifically the company on the meals. The next step was to change the visualization of the grid since I wanted to eventually be able to create a horizontal bar chart. I added two different messages with changing colors according to the input that the user typed for the company field. Knowing that that might be a valid approach, I stylized the text and the icons to be similar than the icons used in the data input to be able to provide more consistency to the user. At this point I started to research how to create the bar charts with the data coming directly from the data input which was more complicated than I anticipated because checking for that number in p5 was not a good idea, therefore I had to go back to the database and the data collection in order to determine which numbers to use in order to create the bar chart. The last phase was to try to get the number of times that I ate with someone vs alone and compare it to the total amount of inputs. With that information I could visualize in the p5,js sketch or directly into the js file where I was receiving that data. The end goal of my intervention was to be able to visualize if I was eating alone too many times in a row so that I could try to be more social during my meal times and hopefully improve my moods and feelings about the meal times. I ended up breaking the sketch and I definitely believe that I was trying something way out of my knowledge, therefore I will continue with this idea for my final project and hopefully find a way to collect and visualize the information in the correct way. For the final project of Tangible Interaction Workshop I was assigned to develop a Human Interface Device (HID) using the mouse or keyboard libraries from Arduino. My interest since I started ITP have been to work on projects that will have a positive impact in people’s lives, therefore I immediately knew that I wanted to work on helping people with some kind of disability to improve the use conditions of the computer. In my undergraduate program I took a class of “Ergonomics” as part of my Industrial Design Engineering carrier in which I developed a glass for people who suffer from Parkinson’s disease and/or hand tremors. The project was very interesting, I had access to users and I was able to test 3d printed prototypes in order to gather feedback, at the moment the project was completely independent from circuits or electronic components therefore my focus was the ergonomics and design of the glass and how to make sure that the proposal was going to meet the user needs. As I already had some knowledge of the disease and the hand movements and limitations I decided to focus my HID in this specific condition. I started the research process by reading papers and articles on how to improve the use of a computer by implementing the system preferences for accessibility, which lead me then to do benchmark on physical products that had already been developed with Parkinson’s disease in mind. It was actually very interesting to see the lack of product design targeted for specific health conditions, I wonder if this could be accredited to the fact that the market is not big enough therefore big tech companies don’t focus their efforts on those illnesses because they are not as profitable as mass consumption artifacts. I believe that it is our responsibility as designers to not only design for the 80% of the population and instead make a conscious effort to push companies and our own design process to be more focussed on the other 20% of the population. 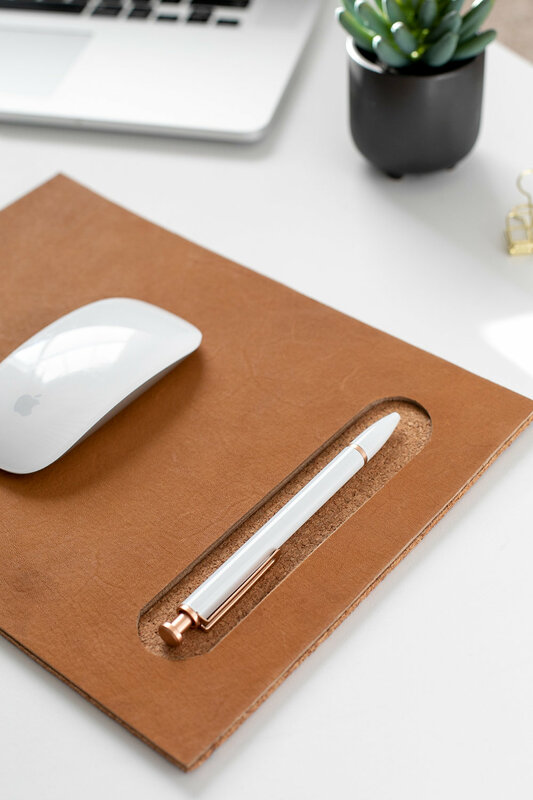 By doing a visual and aesthetic analysis with the previously designed mouse for the selected condition, it is easy to determine that most of them don’t take into consideration the look and feel and the end user’s needs. For example, taking into consideration that the average age at onset for Parkinson’s disease is 60 years old i decided to search for materials, textures and shapes that does not imitate toys or playful experiences, and instead focus on blending into the patients lives in a better and more organic way. 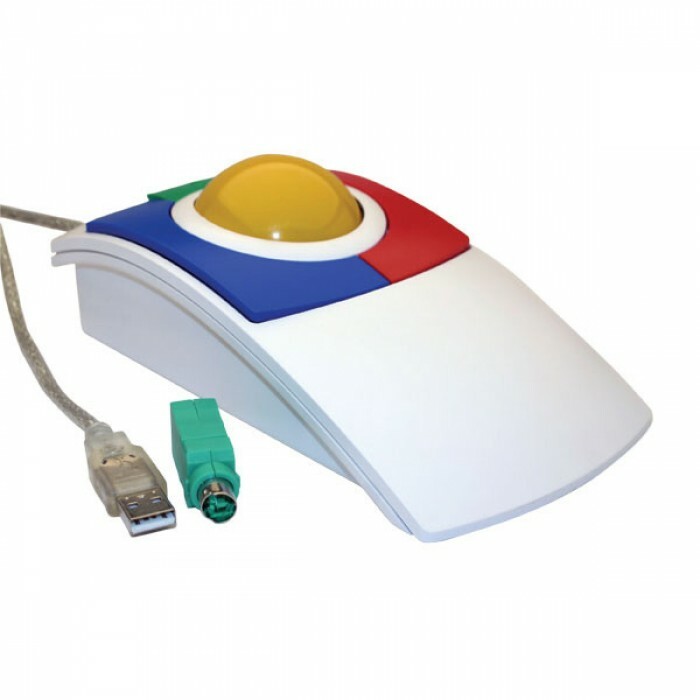 The ergonomic and functional components were very important in my research to determine how to propose a mouse that would be more appropriate for users with Tremors, by accepting the movement of the hand instead of trying to mitigate it. I believe that the biggest mistake from the mouses that I found as “accessible” or adapted for these conditions is that they try to avoid the tremor instead of accepting them as a fact and providing the users with the possibility to interact with the mouse no matter what their hand movement is. As part of my design process I create some sketches that helped me define the way that users interact with the mouse and how the spacial distribution of the elements would provide a better user experience. After I decided the form factor and the way that the components were going to be laid out I started the research process for materials and aesthetics, I knew that I wanted to pursue a more sophisticated look and feel specially because of the target audience. I also focus my research on soft materials, taking into consideration that the tremors cause the hand to move with variable intensity. therefore I need to make sure that I am not going to harm the users due to my material selection. 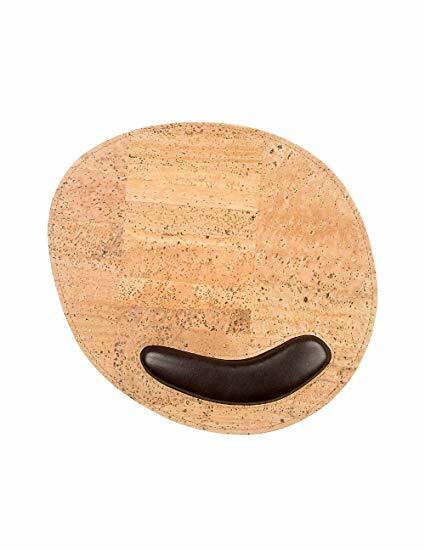 By searching online I became very interested in the compilation of the mouse pad and the mouse in one unified entity. 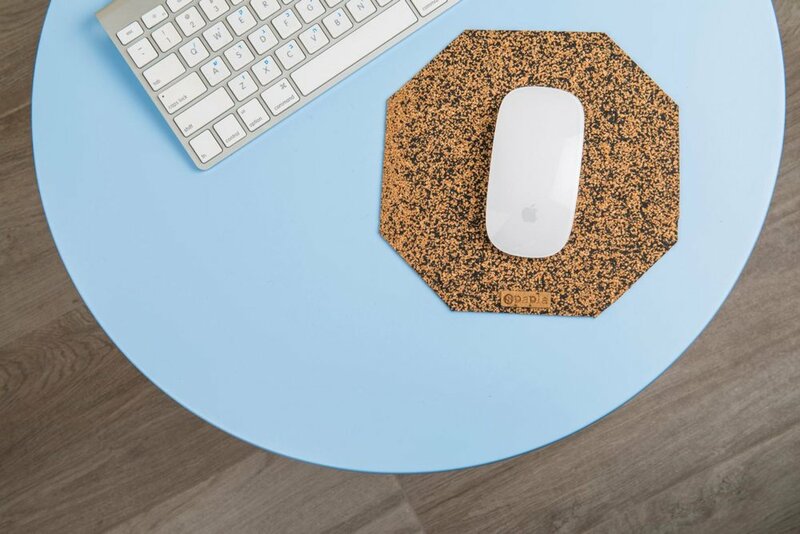 The computer users are already used to use a pad and a mouse together, therefore, even though I will definitely break the mental model of a mouse, I will still use some existing models in order to create an experience that is not that disruptive and the user can feel more comfortable. 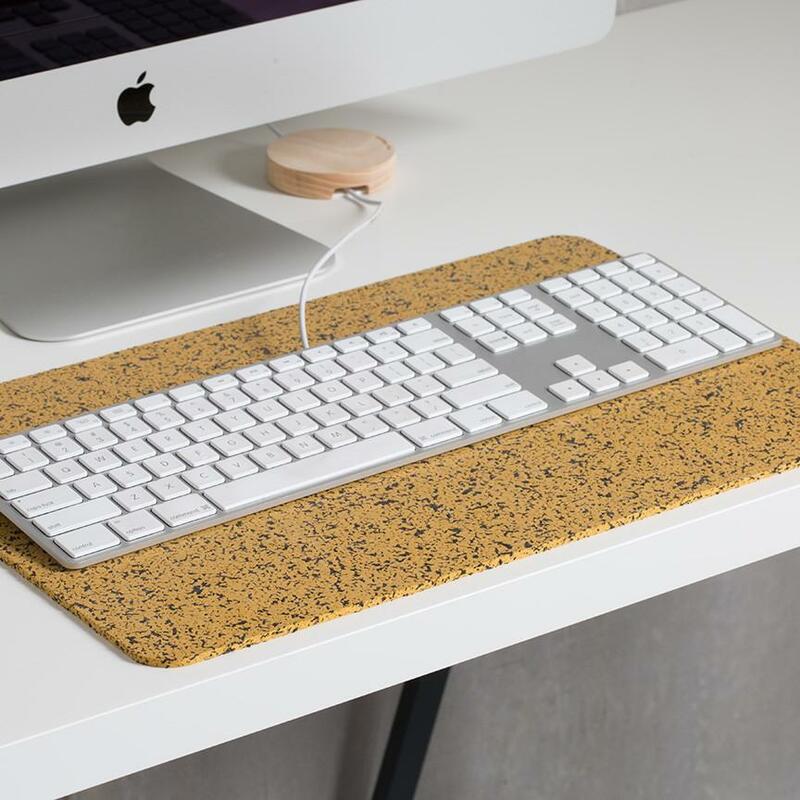 One of my main design goals was to create an external aid that wouldn’t look too weird or visually overwhelming for the users and instead create a product that could blend in the regular workplace, or the space where the users interact with the computer at home. 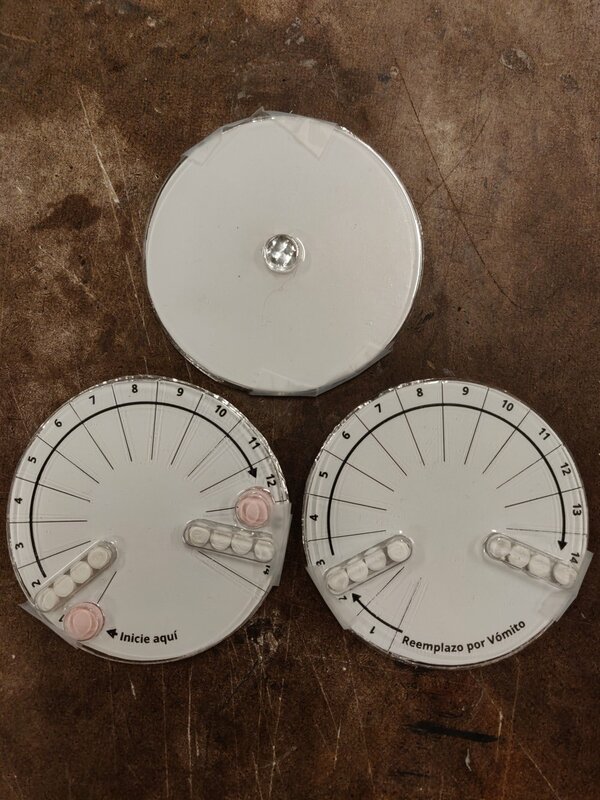 The next step was to test in cardboard the sizes of the octagon, I tested two different sizes and I decided to go for the 10 in size one (the bigger that I tested) because I wanted to provide the user with more space and separation between the buttons in order to prevent involuntary movements. 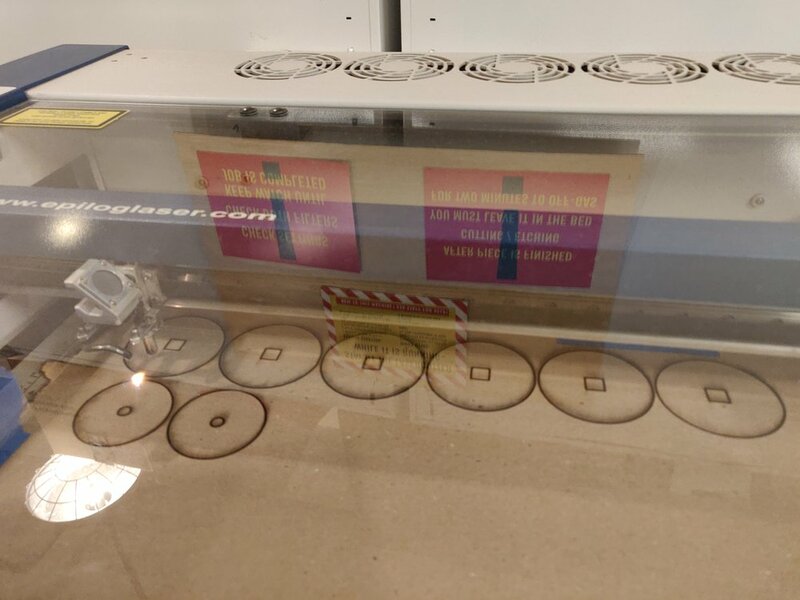 The next step was to laser cut the cork (two 10 in octagons). 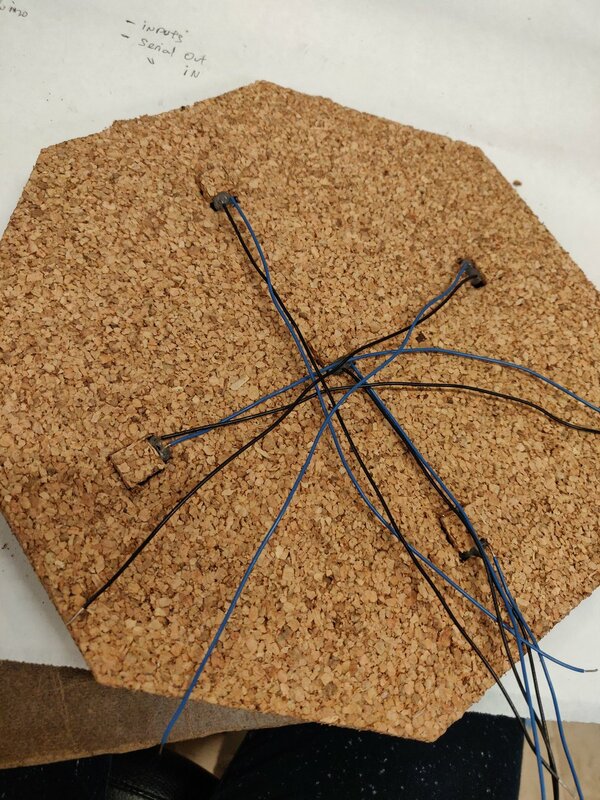 I edged the top octagon with arrows in order to give more visual guidance to the users and I also did 5 holes for the buttons to be inserted and secured. My original intention was to sew the two cork octagons however the one that I bought was too thick therefore I decided to hot glue the two pieces which ended up being a very good choice because it didn’t show and it created a very secure joint. 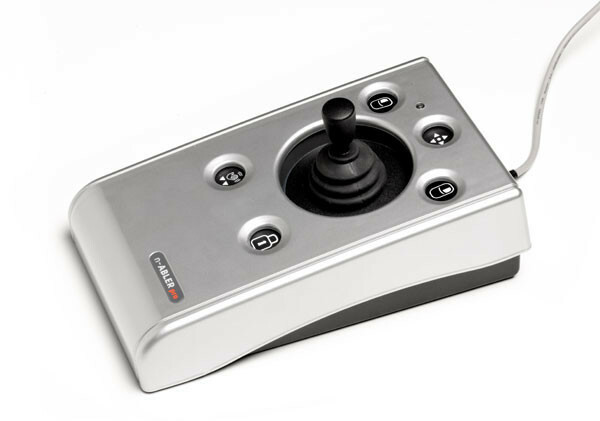 The final result is a mouse that allows the user who suffer from tremors to navigate in the screen by pressing the buttons with any part or position of the hand that they find more comfortable, the weight of the hand will activate the pushbutton inside so they don’t have to make a lot of pressure to be bale to activate them, which is very important because those users (depending on how advance the condition is) might not have a lot of control over the strength in their hands. The mouse connects via USB to the computer. For this week we had two different assignments, the first one was to run the data selfie app and try to make some changes to it and the second one was to complete the express tutorial. I decided to dedicate more time to slowly go throw the express tutorial and be able to understand what I was doing. My goal was to reach the end of the tutorial by having an overall understanding of what I was doing and how I might use this in future projects. I started with the Data Selfie project, I ran it, deleted Joey’s (very funny) selfies from the db document in order to be able to populate it with only my selfies. I didn’t know if I was going to be able to add a new element to the form therefore I decided to start by creating a concept around the selfie collection and change the colors of the font and background. I started by collecting selfies every time I was feeling like I didn’t know what I was doing (I probably escaped a lot of those moments). Since I have been trying to keep track of how I feel around food and how it makes me feel, I decided to use the selfie collection to track the moments when I feel “Hangry”, a combination between being hungry and angry, which happens very frequently since I tend to eat a lot of snacks, however sometimes I just stay at the floor and for different reasons, end up being hungry in front of the computer. I decided to collect those moments and document them with a selfie and a reason (text input) for me to indicate the app why am I hungry? what is the reason why? Did I escape a meal time? did I forget my food at home?, did I get too invested in a project and I forgot to buy lunch? (and the list continues….). I didn’t continue focussing on this assignment because I wanted to dedicate more time to the Express tutorial, which I found very clear and I followed until the end. It was very interesting to see how powerful creating my own API can feel and the amount of possibilities that I have now with this new tools. These are some screenshots from the Express tutorial. This is a summary and reflection about the paper: Participatory design with children with autism (L Millen, S V G Cobb, H Patel) from VIRART, Human Factors Research Group, University of Nottingham. In the context of education there has been some discussion concerning the role that children can take to inform design of instructional technology. Some researchers have moved from concentrating solely on children’s involvement as design partners in the development of technology, to their role as “Experience Design Partners”. The involvement of end-users directly in the design process can be useful to inform adequate design however, this process can be difficult, particularly when end-users have special needs that affect their ability to communicate their views. Individuals with Autism are rarely involved in educational software development and this might be one of the reasons why most of the products are inadequate. This paper present methods used for participatory design with typically developing children and adaptations to these methods for children with autism spectrum conditions. Tell us about the computer games you use and what you like about them. Think about the computer games that you play at school and at home. What makes a good game? 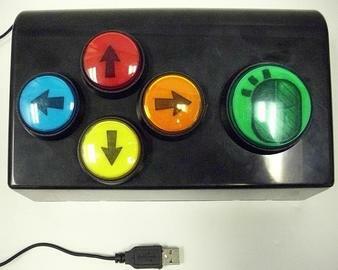 In pairs, design a virtual game for a 12 y/o child who find it difficult to interact with others. In summary the activities were fairly open-ended and students often had to be reminded of the overall aim of the computer game as their imagination took them in many directions. In some areas the activity was not constrained enough to gain information that could be directly fed back into concept elaboration. Adaptation of participatory design methods for children with ASC. Understanding User Needs: Children with autism has a series of cognitive considerations. “Theory of mind” When it is impossible to imagine another person’s mental state. Learning difficulties, the level of ability and understanding may not be sufficient. The freedom given to the typically developing students meant that they often forgot that the purpose of the game should be to encourage children to make friends. The task should be more constrained and with a structured environment in order to encourage students with autism to participate. A review session was carried out with five students (16 and 17 years old) with autism spectrum during the students weekly class by their teacher. It was decided that the review session must be carried out as a group activity and would only focus on the initial training stage of the activity. The group played the training program by taking turns. The students were encouraged to give positive and negative feedback, knowing that there is no right or wrong answer. All of the students engaged very well with the activity. Overall the method was very successful, sufficiently structured and supported by the teacher to meet the needs of students with Autism. One student struggled with a slight inconsistency between the screenshot on the worksheet and the actual view that the program had been paused at. The session did highlight the fact that children with autism often pick up on very small inconsistencies that could cause problems. with the help and support from an experienced teacher these occurrences can be effectively managed. 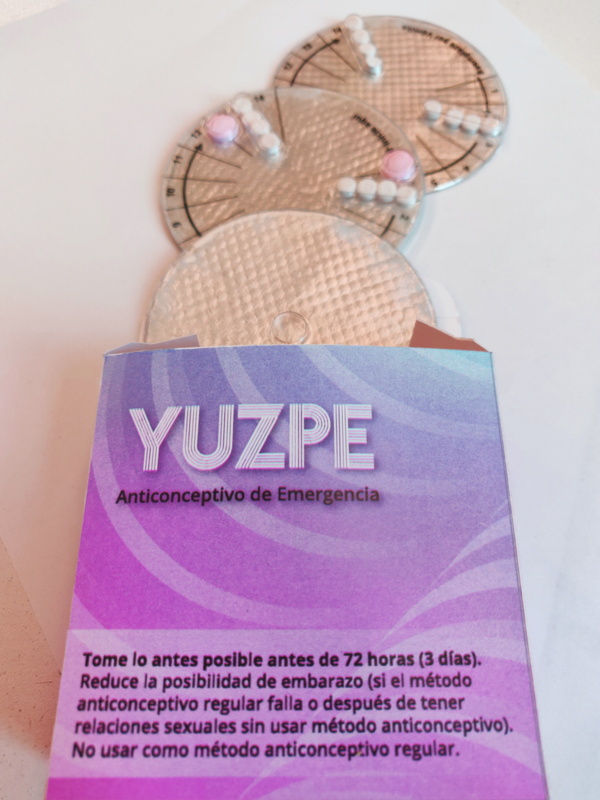 Although it is imperative that researchers approach these sessions organized and well prepared, there should always be an awareness that the method may need to change at short notice. The abilities of children with Autism varies a vast amount and therefore the method presented here may not be ability appropriate. It is important to always discuss and adapt plans with school contact prior to the visit. The scenario design method was trialled with three students with autism aged 13 and 14 years over the course of two hours. The activity was supposed to last only one hour however the students were enjoying the activity and the supervising teacher asked if they could continue. Initially, discussion was a little hard to generate but when presented with the drawing tasks the students became much more involved. One student in particular who is usually reluctant to engage in conversations was voicing extremely interesting ideas. The use of personas had mixed results. When informed that the group would be designing the game for this fictional children kids reacted with: “But Why? They’re just on paper” and “ Are we going to meet them?”. The use of this tool needs further consideration. The decision space for the student was still too vast and relied heavily on the student’s imagination. With the students struggling the researcher decided to take a break and drew sketches as an example. There was still reluctance to put pen to paper. The researcher offered to start the drawing and then the students suddenly started to take over the drawing. The students were motivated by their own drawings and this created a domino-like effect of ideas. Involving users through the technology design process is important and useful. Achieving the involvement of children with autism requires careful consideration. Children with autism should not be excluded from the design process. Not only is this process beneficial for us as design team but it is also an important opportunity for the children where they are encouraged to voice their opinions. For the Lo-Fi Toy Prototype ( originally posted by Lydia ) we were asked to present in class and document the feedback received during the demonstration. The plan was originally to test with kids however we did the test with the host professor Alex, who came to our class and reviewed our ideas. Team members: Lydia, Veronica, Arnab. 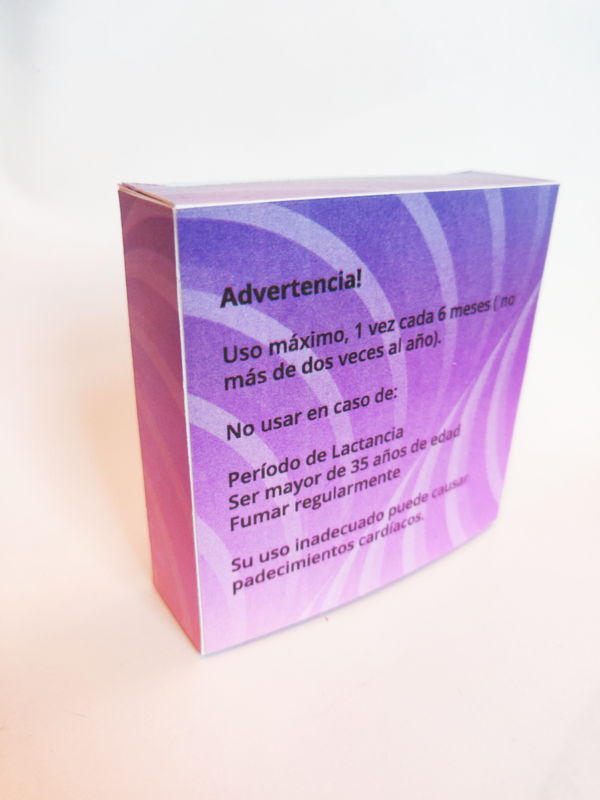 Our toy consists on a sound collector companion that the kid can take around in order to collect sounds and interact with the visualizations that happen in the belly, that are going to be affected by the kind of sounds that are being collected. The main purpose of the user testing was to understand if kids are interested in collecting an input (sound in this case) and having the toy displaying it in a different output (visuals/ colors). 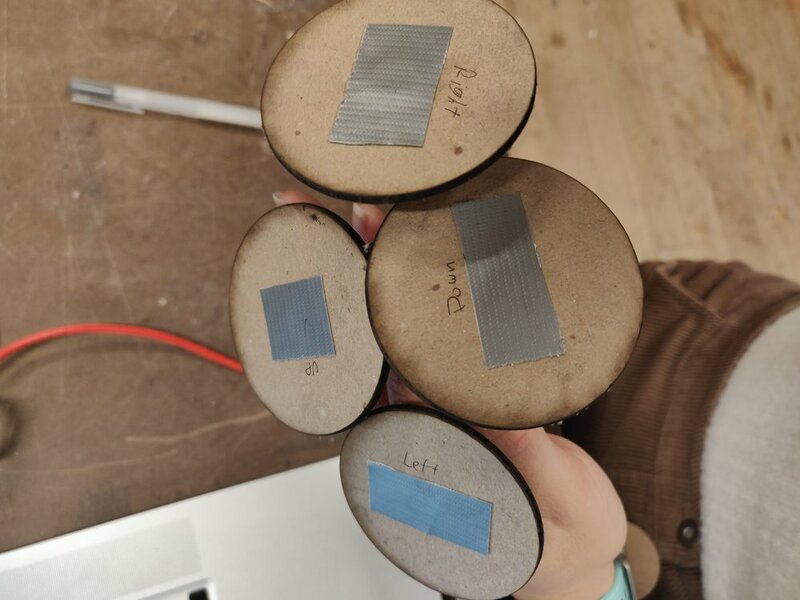 We had to explain all of our thought process, starting by the ideation and also how our fabrication and coding processes affected the final result of the prototype. The next step was to make a demo with the toy functionalities. 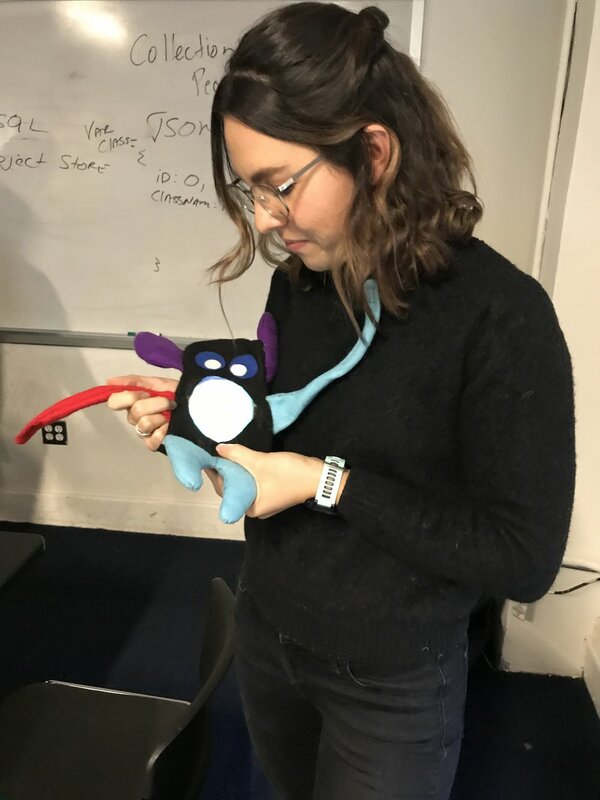 Our hypothesis was that the users were going to hold the toy and walk around collecting different sounds, however we realized that they stayed in only one place, probably because the toy was not intuitive enough about the change in the visualization according to the pitch of the sound. This was our first and very valuable observation because it did’t depend on what users told us, but instead in what we observed during the testing period. The users started making weird sound and clapping to the toy to try to identify what was causing the change in the patterns and colors. We immediately noticed that the users in the class knew about programming so they were probably trying to identify which sound parameters we used to map the output in the visualization. Having noticed that our audience wasn’t going to give us the feedback that we expected from kids, we decided to start asking for more design/interaction focussed feedback. 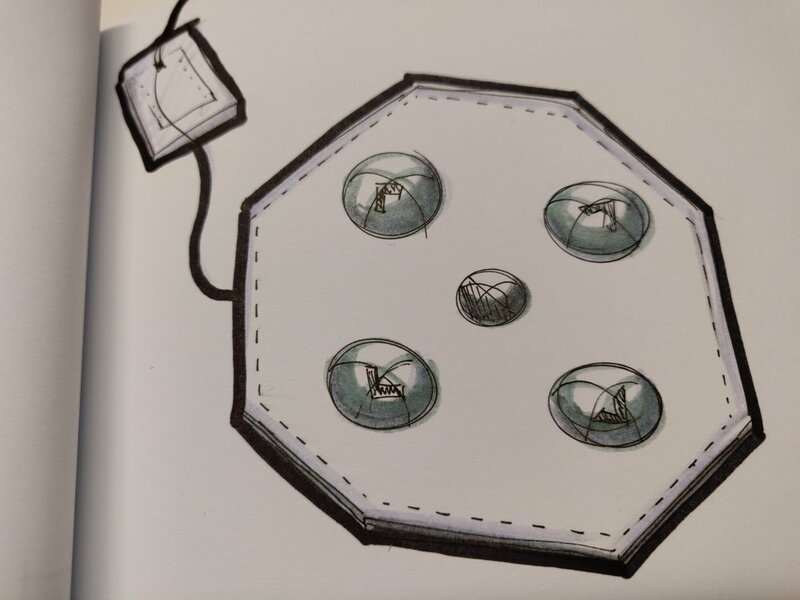 In that moment we started receiving very interesting ideas surrounding our original proposal but augmenting the “storytelling” around the interaction. We received the very interesting feedback to create a Science Companion that helps the kid to collect temperature, environmental data, rocks, etc. With that data provide the kid with the possibility to do a palette of the collection that can be later used to create different outputs. 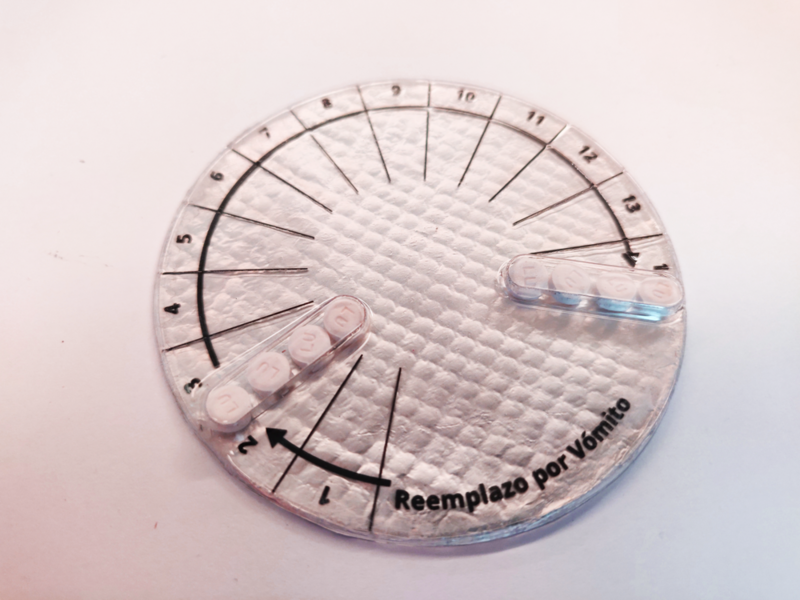 Example: The Science companion helps the kid to collect rocks, the kid create a palette of rocks that can be later used in order to create a brand new rock. We intend to incorporate some of this feedback, we are still missing the very important factor of testing with kids and understanding if they find this change between input/output by exploring their environment interesting and playful in the same way that we are imagining. For our next steps, we took a pattern making class in order to remake the toy in a more three-dimensional shape that will look more polished, we also decided to provide the kid with the possibility of using the companion as a Fanny bag, therefore we will have to work on adjustable straps. In the coding and interaction we are planning on exploring more obvious ways to generate the change between the input and the output in order to motivate the kids to move and collect more variety of sounds. For this week’s assignment I decided to start working on an idea that I would like to develop for the final project of the course, start understanding how to manipulate the data visualization and the importance of collecting meaningful data in order to self track myself and make behavioral changes according to the knowledge acquired by doing this exercise. I consider myself as a healthy person, who loves exercising and eating healthy food, but at the same time I enjoy exploring different restaurants, new food and experiencing places throw food. I have noticed that since I moved to NY, and obviously changed my lifestyle, it is more difficult to dedicate time to exercise and cook healthy meals which have been affecting my emotional health. 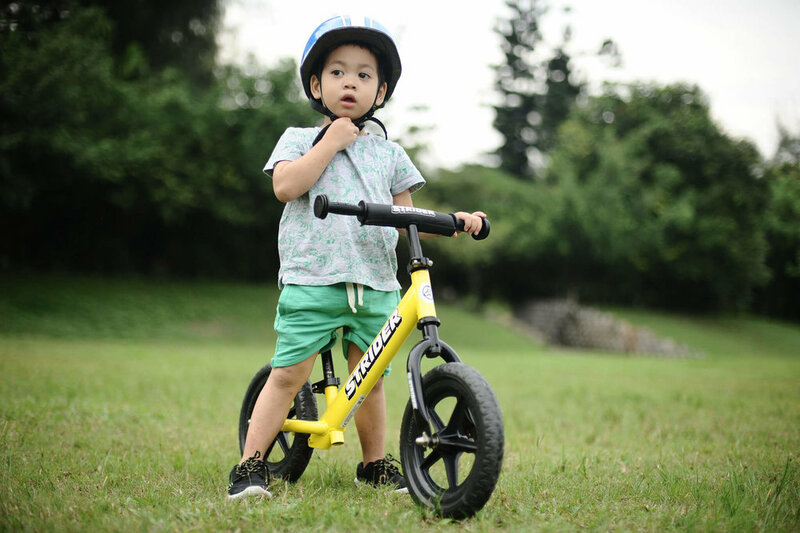 Strider is a brand of balance bike: a type of learner's bicycle that has no pedals but is instead propelled by the rider pushing their feet along the ground, designed to help young children learn to balance and steer. I decided to analyze this toy because of its flexibility of use, the ability to be used by children of different ages and also the accessibility for children with disabilities. The toy encourages and teaches kids how to balance so that eventually they could transition to using regular bikes with more security. The use of Strider bikes is also encouraged for kids to play outdoors and do physical activities instead of being trapped inside a house or an apartment playing with video games. The creator came up with the idea when he wanted to teach his 2 y/o son how to ride a bike and he wasn’t able to do it because the “kids bicycles” in the market didn’t behave in a way that suited the children needs. He then decided to design a more basic balance bicycle that would help little kids how to balance first and then eventually be able to transition to pedal bikes. He describes the concept as follows: "I wanted to really just strip it down to its essence. Two wheels, a seat, and a handlebar. That's it." The advertisement around the Strider balance bike goes beyond just the physical product, they create a fun and engaging activity around the use of the bikes. Strider organizes “Strider Camps” and “Strider Races” across the country and even internationally. As a quick anecdote, when living in Costa Rica I saw a lot of kids engaging in this kind of activities, I was training in a running team and my coach’s daughter (4 y/o at that moment) was starting to use the Striker bike, her dad as an athlete wanted to encourage her to so sports as early as possible so he enrolled her in some competitions to get her started. An interesting interaction about the way that the brand tries to engage kids and parents with their products is by creating camps and competitions, and they use social media to reach out for kids. In Costa Rica they created a Facebook competition, where the parents uploaded a picture of their kids using the Strider bikes and the one with more likes would win a free enrollment in the Strider Camp, of course I believe that this whole concept is highly monetized, and for the third world scenario where I was living, this might not benefit all the population, however they were giving options such as social media competitions and even scholarships for the kids to get engaged in learning and competing. The experience that I saw from my coach is that he was able to encourage his daughter to start practicing a competitive sport since a very young age and at the same time engaging family and friends with her early development. The fact that they had to collect likes gave the Strider bike a lot of exposure and probably encouraged other parents to buy the bike for their kids and sign them up for start competing. In the pictures below you can see in the left, Valentina holding hands with Christian her father, who is finishing a marathon and trying to give her the example of regularly exercising, and then in the right is Valentina during one of her multiple Strider competitions in Costa Rica. 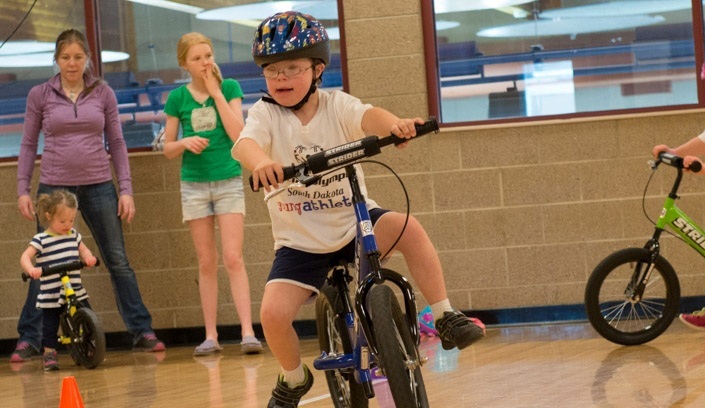 Strider Bikes have different products for different age ranges and also they offer products for children with special needs such as Down Syndrome, generating a big range of products that can be used by a large portion of the infant population. The inclusiveness and accessibility of the Strider Bikes is well advertised throw their media channels and they make sure to dedicate a special tab in their website for testimonials. The emphasis that is put into the Testimonials section of the website is very interesting because they make sure that as a company (at least try) to create a product that is more accessible and at the same time they use this concept as a way of advertising the product and the values of the company. The changes or modifications in the shape of the bikes are not noticeable at simple sight which for me is a key characteristic of an “accessible” toy, specially because children with special needs can use essentially the same bike as their friends which I believe gives them a sense of independency and acceptance from others. Sometimes when a technology in general tries to be more accessible ends up making very obvious morphologic changes which end up affecting in a very negative way the intention of children to want to interact with it because they are afraid of being pushed away by other kids, therefore I believe Strider bikes is making a good effort for empowering kids with special needs. The Strider Education Foundation is another initiative from the brand to be more inclusive with kids who’s parents have low income, which as I mentioned before, it might be a roadblock, specially for the camps and the races. The fact that they give away scholarships and they implement trainings at public schools gives them a broader scope to where their product can be positioned and enjoyed by kids. They also have the possibility within their own website for general users to “Adopt a school” and in that way be able to generate more impact through their products and programs. They also give the user the possibility to adopt and entire District, School or do a general donation. The website also has a separate page for Strider Education, focused in two different emphasis: Parents and Educators. 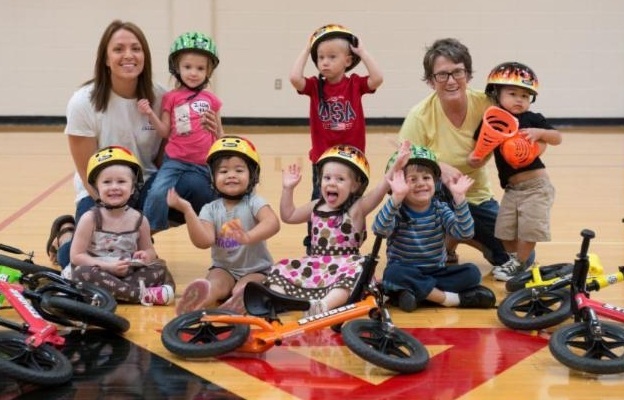 Their focus is on the fact that they first need to learn how to teach their kids specially because the main purpose of Strider is to eventually teach them how to ride regular bicycles and motorcycles, therefore the confidence that is built during the first years of interacting ith a balance bike is fundamental. There is also a factor of fear from parents specially if they have very small kids and they want to introduce them to the concept of the balance bike, this is where the education comes in very handy and it gains importance. In conclusion I believe that the overall concept and use of the Strider Bikes is built with a very good intention that is being appropriately used around he world, I tried to search for different or bad uses of the bike and I didn’t find any shocking result so my assumption is that this is a fairly safe and interactive toy that encourage kids to learn how to balance, compete and have fun with their parents and friends, it also motivates them to go outdoors and stay away from technology and do physical activity, which in my opinion is very important for the early stages of development for children.